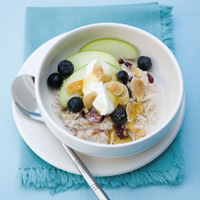 A great energising oat, fruit and nut combo breakfast, which is easy to prepare the night before. 1 Mix porridge, cinnamon and milk in a bowl and leave to stand overnight. 2 Spoon the porridge into a bowl, top with fruit, yoghurt, nuts and drizzle with honey to serve.